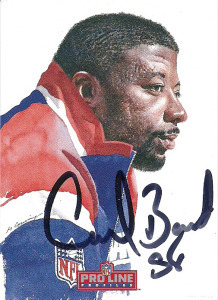 Carl Banks played for the New York Giants on a stellar defense. He was a quiet, but noticeable force at outside linebacker that punctuated his career with hard hits and turnovers. Frequently leading the Giants in tackles, Banks was a consensus All-American while playing at Michigan State, where he recorded 284 tackles over his 4 years for the Spartans. He’d be taken in the first round by the Giants during the 1984 draft. His best season came in 1987 when he earned AP and Pro Bowl Honors, with 9 sacks, 101 tackles, and 2 FF in just 12 games. In 1988, Banks intercepted a pass in the 4th quarter and returned it for the game winning TD against the Falcons. Later again in 1989, he posted a single season franchise high 7 forced fumbles. 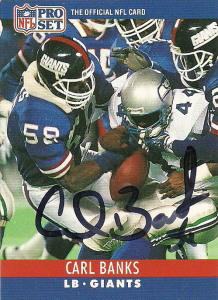 Banks was frequently overshadowed by Lawrence Taylor on defense, but Carl had a habit of showing up most when it counted. 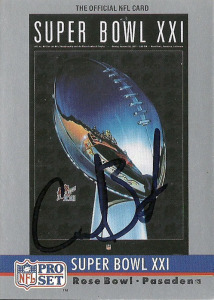 In Superbowl XXI, he had a team high 10 tackles in a 39-20 win over the Broncos, earning Carl a nomination for the Super Bowl 25th Anniversary Team. In 1993, he jumped ship for the Washington Redskins, and then a final 2 seasons in Cleveland for his former defensive coordinator (now coach) Bill Belichick, retiring after the 1995 season. Carl loves doing radio- something that goes back to his playing days with the Giants. Banks was also part owner of a New Jersey Red Dogs in the Arena Football League, and briefly worked for the Jets in 1997. Otherwise, Banks has received numerous accolades from the Giants, including induction into the team’s Ring of Honor, and a member of the Giants’ All-Decade 80s team. Carl had some amazing cards once the newer players got involved in the business. This ProSet 1990 card is among one of my favorites showing him in action stripping the ball carrier of the rock. I didn’t really like the ProLine series of cards. Most of the cards did not have a football shot, rather they focused on the player’s real lives, interests, and family. Still the subset of portraits, illustrated by Merv Corning (who worked on the Pro Set 1990 SuperBowl MVP subset) is just exquisite, and I am very impressed by the interaction that he uses to activate the white space on the page.